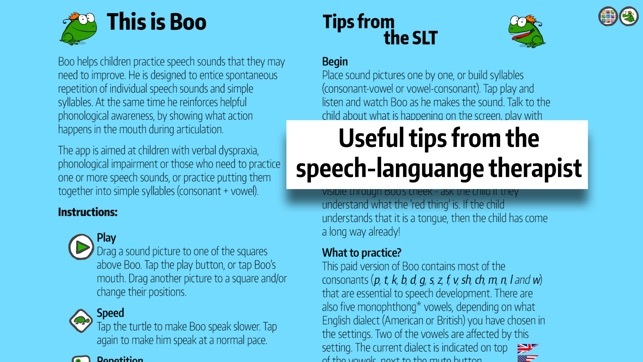 Boo helps children practice speech sounds that they need to improve. He is designed to entice spontaneous repetition of individual speech sounds and simple syllables. At the same time, he enforces helpful phonological awareness, by showing what actions happen in the mouth during articulation. 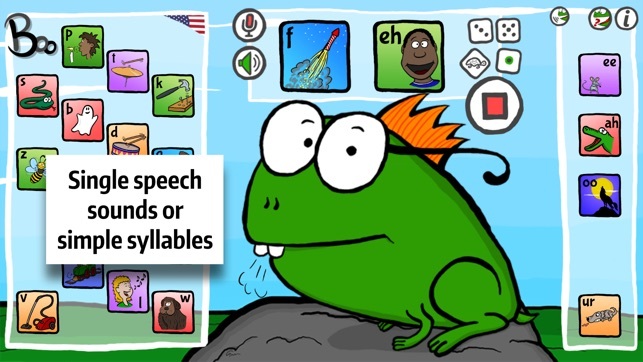 The app is developed by a certified Speech-Language Pathologist. 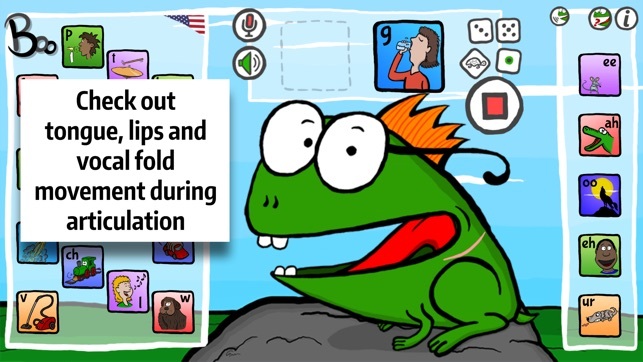 The children can use the app all by themselves or together with an adult. When the child simultaneously uses multiple senses (vision and hearing) to imitate and repeat it becomes easier to overcome obstacles and improve its articulation skills. Boo may be a stepping stone to better pronunciation! 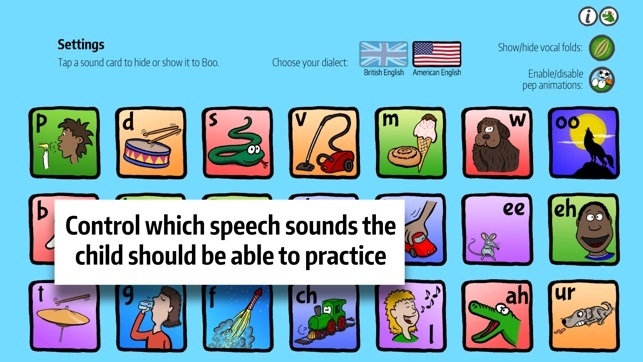 Boo can also be a helpful pronouncing learning tool for those - young or old - who are currently learning the English language. In the app, you put one or two sound cards in corresponding fields, building a sound or a simple two-letter syllable. Then, Boo articulates the sound or syllable, clearly showing mouth, tongue and vocal folds movements during articulation. This may be enticing for the child to imitate and recognize how the sound syllables are made by tongue and lips. 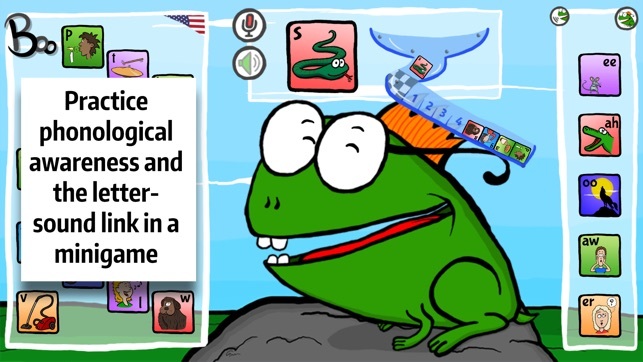 There is also a minigame in which you can practice identifying different speech sounds as Boo articulates them, either with sound or muted using only visual cues. Boo Articulation Helper is developed by a speech and language therapist/pathologist with therapeutic experience with developmental verbal dyspraxia or articulation/phonological impairments. The app is tested by eight children in their homes, aged 3-6 years, seeing a SLP on a regular basis. The try-outs have shown an improvement of training motivation and spontaneous repetition of speech sounds in a way that proved more difficult with other training material and methods (undocumented). I absolutely love this app! It is great for young kids with articulation delays and apraxia of speech. It is engaging and funny and the kids love to imitate boo! I love the ability to change sounds anytime, turn the sound on and off as well as being able to slow down Boo’s speech if needed. The only thing that would make this better would be the ability to make CVC words as well. I downloaded this on my iPad and iPhone for our daughter. Despite my speakers working, no audio comes from the app. I can’t find any contact info for support. Happy to revise review if you can point me in the right direction to fix this issue. As a speech-language pathologist, this is a handy app. The feature of showing tongue placement during production of speech sounds is helpful. However, since the most recent update the sound output seems to have disappeared. I’m looking forward to a fix for this change.